Usyk vs Huck in Berlin on Sept 9 - Tickets on Sale! 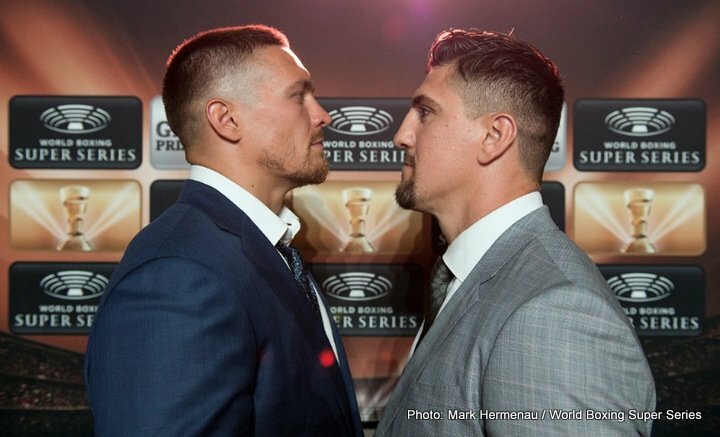 WBO World Champion Oleksandr Usyk (12-0, 10 KOs) and Marco Huck (40-4-1, 27 KOs) both confident before the first ever contest of the World Boxing Super Series, the cruiserweight quarter-final at the Max-Schmeling-Halle, Berlin on September 9th. “Usyk is the so-called favourite, but he will regret that he picked me,” said Huck, who held the WBO title from 2009 to 2015, making thirteen consecutive successful defenses. Number one seed in the 200lb (90.7 kg) bracket, Usyk, picked the experienced German fighter at the the Draft Gala in Monaco in July. 30-year-old Usyk, who took Gold at heavyweight at the 2012 Olympic Games in London, will have been reigning WBO World Champion for almost a full year when he enters the ring in Berlin. Ticket details for the World Boxing Super Series’ quarter-final bout between Oleksandr Usyk and Marco Huck at the Max-Schmeling-Halle, Berlin will be announced shortly. Heavyweights Burak Sahin (11-1, 7 KOs) and Jone Volau (5-2, 2 KOs) will go head-to-head again when the World Boxing Super Series premieres with the quarter-final clash between WBO World Champion Oleksandr Usyk (12-0, 10 KOs) and Marco Huck (40-4-1, 27 KOs) at the Max-Schmeling-Halle, Berlin on September 9th. “I’m excited – no, excited is really an understatement,” said Volau. “I am overwhelmed at receiving this opportunity to fight on the World Boxing Super Series undercard,” said the 34-year-old British-based Fijian. 26-year-old prospect Sahin, from Berlin, suffered a shocking first career stoppage when Volau overpowered him in the third round of their first fight in June in Hessen, Germany. Volau aims to cause a stir in Germany again. This time at the Max-Schmeling-Halle, a venue named after the famous German Hall of Fame boxer who is fondly remembered for his rivalry with Joe Louis, the legendary heavyweight from whom Volau got his nickname ‘The Brown Bomber’. Burak Sahin is however keen to add a victory to the story of the showdowns between him and Volau. Also on the undercard will the highly rated German super middleweight prospect Denis Radovan (5-0, 2 KOs). Trained by WBSS super middleweight contender Juergen Braehmer, Radovan has made an impressive start to his professional career winning all five of his contests. The 24-year old, from Cologne, takes on his toughest opponent to date in France’s Yann Binanga Aboghe (6-1-1) in a 6-round contest. You are here: Home / Boxing News / Usyk vs Huck in Berlin on Sept 9 – Tickets on Sale!